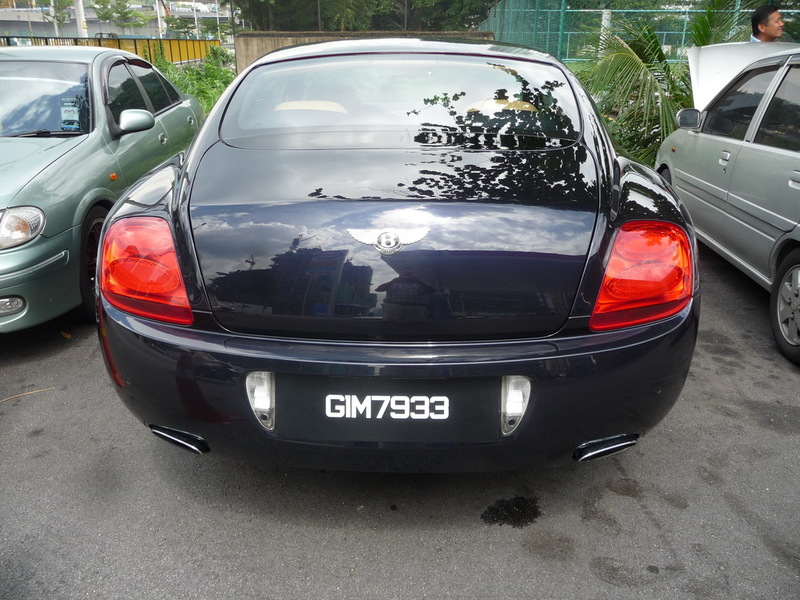 Since 2010, some wealthy folk are circulating in Malaysia carrying a new type of special plate, using a G 1 M prefix. My first was seen in Penang in Feb. 2011, on a brand new Jaguar sports, which I followed and photographed but lost the image in an irrecoverable external memory crash. The prefix G 1 M is said to reflect an new imaginative concept of the Prime Minister, to encourage his citizens to think of Malaysia First (1 m) and the ‘G’ abbreviates ‘Glory’ or ‘Glorious’. The PM has allocated stg.£8-10m. to support the scheme in its many facets, possibly to companies with which he is friendly and who are co-operative in his ventures. Personally, I don’t like many forms of vanity plate, whatever it ‘celebrates’. It is ostentatious – and plays into the hands of cynical registrations authorities, who delight in grabbing money for nothing, from a naive motoring public. I am impressed by such as the Germans, who have held back, surely against great pressure to turn their excellent system into a plaything. 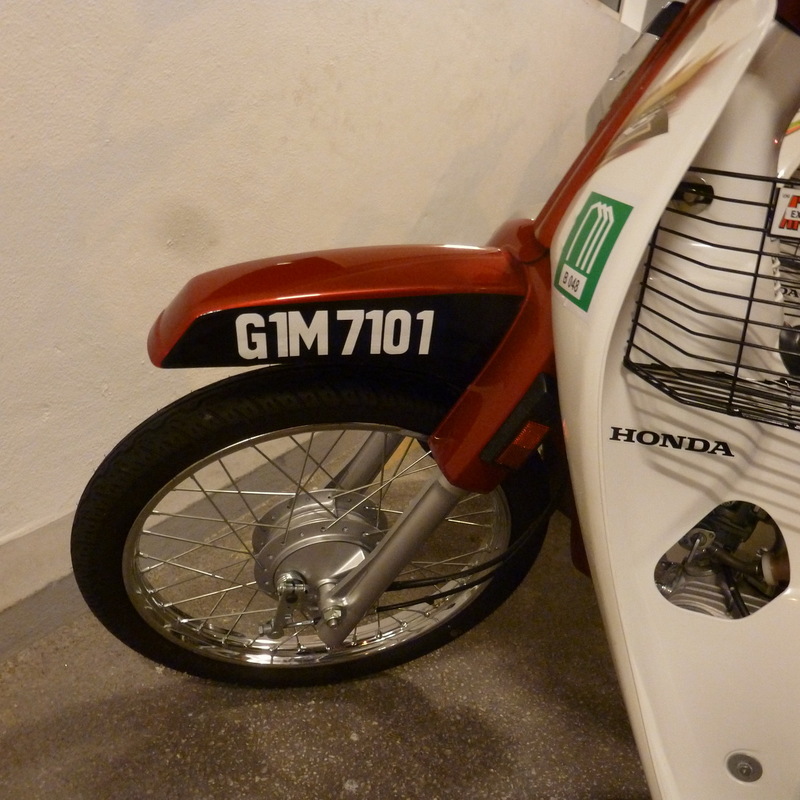 During a 2013 visit, I am astonished to see this rare plate on a moped! Wonders will never cease. G 1 M 7101: Glorious One Malaysia seen, unusually, on a moped in Penang Feb. 2013. This vanity format is usually borne by Porsches and Bentleys! Maybe a tender to a Malaysian yacht…..? This entry was posted on Thursday, December 1st, 2011 at 4:51 am and is filed under Malaysia, vanity/special issue. You can follow any responses to this entry through the RSS 2.0 feed. You can leave a response, or trackback from your own site. 2 Responses to Malaysian special issue. Pal of Jim Gordon, Alex, from K.L. gives us this run-down on G 1 M.
G1M stands for “Gagasan 1Malaysia”, which translates from Malay as “1Malaysia Concept”. These plates ended up fetching big sums of money – for example, single digit numbers were sold for over 50,000 USD. Double digit numbers like 50, 15, etc and repeated numbers like 333, 88, etc were also pretty expensive, selling for more than 5,000-10,000 USD. The only “cheap” G1M plates were the ones with random numbers, like 104, 487, etc, but even those were sold for about 1,000-1,500 USD or around that price, depending on the plate. G1M 11 was given to the current prime minister as a free gift, because all of his cars are using “11” plates. Because of the price and exclusivity, a large amount of G1M plates ended up on luxury and sports cars like Ferrari, Lamborghini, Porsche, Maserati, Mercedes-Benz, BMW and Nissan GT-Rs. The trick is this – as you may know, the tax for imported cars in Malaysia is pretty high, but we have one duty free zone here (Langkawi island), where you don’t have to pay the tax, i.e. you import the car at cost. Quite a number of rich people registered their cars there with G1M plates, so that they don’t stand out from the crowd. This way, they saved a couple of hundred-thousand dollars in tax. Normally, Langkawi plates would be KV 1234 D (current series), but some rich people don’t like Langkawi plates, because everybody would know that they registered the car in the duty free zone.